Adds black and white grain of given amplitude and frequency to the source clip. Amplitude: Default: 0.1, Range: 0 or greater. The amplitude of grain to add. Frequency: Default: 100, Range: 0.01 or greater. 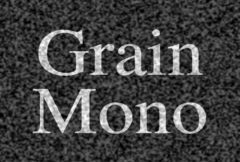 The frequency of the grain. The number of octaves of grain to include. Each octave is twice the frequency and half the amplitude of the previous.